The Archbishop of Erbil in northern Iraq, who is overseeing the care of thousands of displaced Christians who fled Islamic State jihadists, has announced ambitious plans for the Church and charities to reconstruct their towns and villages. Archbishop Bashar Warda told Catholic charity Aid to the Church in Need (ACN) that he is raising funds for the rebuilding of the villages and their social infrastructure so that the IDPs (internally displaced persons) can return to their villages “with hope and security”. He made his comments as a priest involved in aid work in the area urged the international community to launch “a new Marshall Plan” there, At the same time, he urged the international community to fund a “new Marshall Plan” there, akin to the large-scale US investment and aid that helped western Europe regain economic stability after World War II. The archbishop noted that returning to villages liberated from IS had been a painful step for the Christians who were chased from their homes two and a half years earlier. “The desecration and destruction in the newly liberated villages was so personal in its hatred and anger that it dealt further deep and destabilising blows to the IDPs when witnessing their destroyed homes, livelihoods and communities,” he said. He envisaged a “two-to-three-year transition period” before the IDPs might be able to return from Iraqi Kurdistan to their towns. 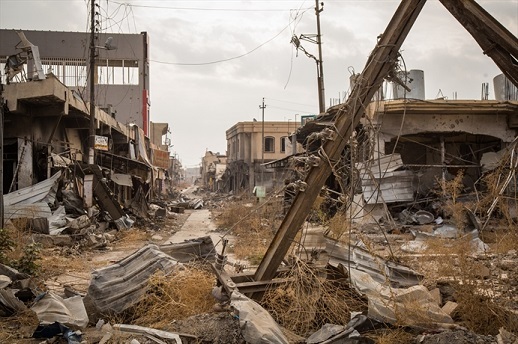 This is to allow time for the nearby hub city of Mosul to be fully liberated and the city and surrounding areas to be cleared of mines and booby traps. He added that it was also vital that they “assess the state of mind of the Mosul people after two and a half years of being under ISIS”. He said reconciliation work will be needed to address high levels of fear, and the likelihood of revenge, in the city and the surrounding areas. He also said that while initially no families were expected to return before June, a few families have decided to return this winter. The priest told Zenit news agency that the challenges for people wanting to return include IS’s appropriation of abandoned homes and the alleged use of chemical weapons in the destruction of Christians’ properties, as well as the persistent fear of attacks by Islamic extremists. At the same time, he said the international community must also get involved in documenting “the destruction and the violent acts of persecution, so that, in some way, a sense of justice and peace can return and help ensure this never happens again”. ACN said it allots more than US$300,000 per month to support 13,200 displaced Iraqi families being cared for by the Church in Iraqi Kurdistan. The Catholic Bishops’ Emergency Committee there spends on average $1.2million per month supporting displaced Iraqi families. Some charities say little or no aid reaches IDPs there from international donors, such as UK AID or its US counterpart, USAID.